This house is AWESOME! In the morning(6AM) the surf is under the house. You wake up to a quiet sunrise on a perfectly covered porch and its cool to watch the wade fishermen trying to catch the tide receding. About twice a day there were large tankers going in and out of the jetties. My kid especially liked that part. You are about a half mile from the jetties so you get a great view without the late night fishermen bothering you. The only complaint I had was that since this is such a nice spot, people who are just coming out to the beach tend to set up camp directly in front of the house with no regard to the fact that you actually rented the beach house. Other than getting out and setting up the beach spot for the day before 8AM, I don't think there is anything anyone can do about it since the beach is public property. I don't fault the rental company for that at all, it just gets a little annoying when strangers try to shove into your vacation. Other than that, it was perfect. 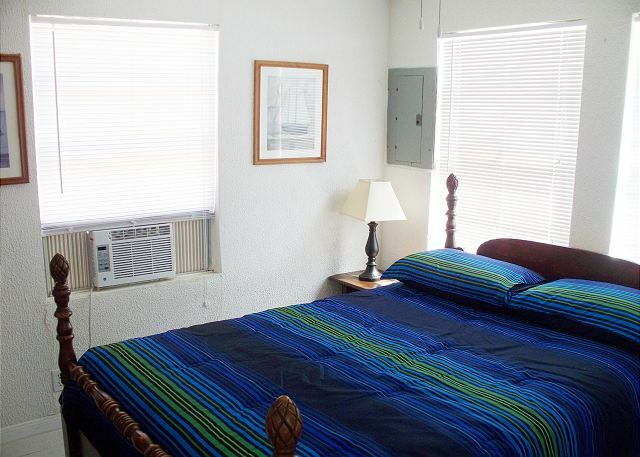 The beds were comfortable, the window unit ACs kept up with the Texas summer, all appliances and plumbing worked. My favorite part was the porch. It is so soothing to just sit there at any time of day. The porch provides at least 75% shade throughout the entire day, regardless of the suns position. Gah, the hardest part was leaving that porch! We were able to bring our two large dogs and they enjoyed taking naps out on said porch as well! Seriously, I promise that you have never stayed in a beach house closer to the water. It is a phenomenal place! I highly recommend it! My wife and I plan to make Thunder Point a yearly family vacation! I have too say this was the most relaxing vacation we had!! 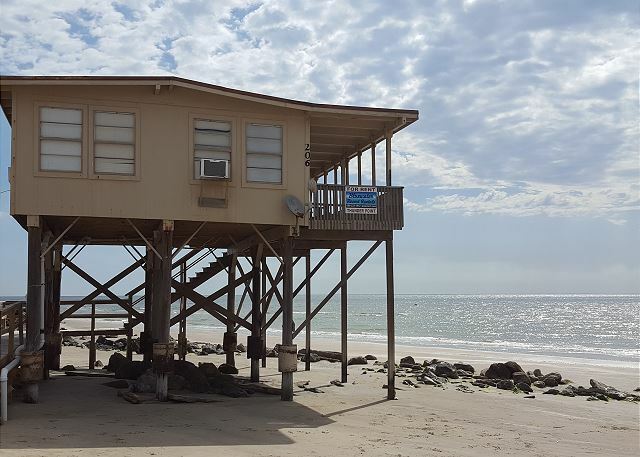 The staff was so kind An gracious An very accommodating.. we love this thunder point house it so nice too be onthe beach, we had such easy access to walk on to the beach an swim, we love that underhouse it provided shade. And it was so nice that we were able to stay an extra day! We will definitely be back next year!! Aside from beach goers under the house every day and no garbage can, we enjoyed the house. Bring salt and pepper! Things you would think would be in the kitchen were not. The property description is very accurate. The location is outstanding. The neighbor behind came out every time one of our guests drove up and made sure to mention parking. We thoroughly enjoyed the view from the front porch. If there were screens on the windows we would have slept with windows open. Even with A/C running though, we could still hear the surf under the house at night. The shower is very, very tiny and I am not a large person. The only thing we didn't have in the kitchen was a spatula. Everything else was well stocked as far as dishes, etc. go. Our only complaint, and it will probably keep us from renting this house again, is the awful water quality. We went through 3 gallons and a whole case of bottled water in three days. The water isn't really suitable for even washing hands. It leaves a very bad smell on everything it touches. Considering that this is the price of a pretty nice hotel, per night, hubs thought some kind of service would have been nice...like taking out trash or something. This house is somewhat "rustic" but has all the basic necessities, aside from fresh water. One other thing to consider are the stairs. There are a few steps with no hand rails and the walkway leading up to the stairs, and the stairs themselves are what I would consider unsafe. There is only a rail, with nothing to prevent a child or anyone from falling quite a distance. The porch at the top of the stairs in front of the house is safe as can be. We love this place! We try to rent it every summer because you can't get any closer to the water than you can at Thunder Point. Can't get more waterfront than this! The house is as advertised and was in good condition. Over the years the beach has receded and this house if often over the water. We had to drive a few miles to get to a great beach area. We liked not have anyone between us and the gulf. The furniture is worn out and needs some upgrading. We rented for an extended weekend, we have stayed here multiple times before and the location was great for us. Only issue here is lack of parking near the house, but we managed. We have been coming to Thunder Point for the past few years. Overall we had a pretty good time. For the first time we had trouble with the toilet and had to call a couple of time before it was resolved. But I will say the staff was really trying to fix the problem. Pretty good stay overall. This may be an older house compared to many, but I think this may be one of my most favorite that I have ever stayed in at Surfside (this is our 9th one). It wasn't fancy, but it had everything we needed and the location was awesome! Would definitely stay here again!! This place is great! Best view I have ever seen. The house is minimal, tube tv,vcr,etc. Has window units which work great. If you want a quiet place to rest and relax this is your place. I will definitely be back next year if not sooner. Thank you Brannan Rentals for a great vacation. This is a great little place directly on the beach. It was nice to watch the dolphins from the front porch along with the fisherman. Only down fall is there isn't a private driveway you have to park at the end of the road which is a few hundred feet away from the house walkway. We had a nice three day weekend. The home was what we expected and we adapted to the unique weather. The tides were high and the water was all the way under the house for the weekend stay. Really unusual and really cool. Parking was a short walk away, but not a problem. Weekend getaway trip, the location was great for what we were looking for. Right on the water. The house is not too fancy but is functional and had everything we needed. Great trip! WOW! Right on the water. Can't get any better! Beautiful and enjoyable stay. So relaxing to sit on the porch and watch the waves. This is our fourth year and each year gets better. We have stayed here several times and will be back. The beach was very clean and really enjoy the house being right the beach. Great location - to get any closer to the water, you would be IN the water. 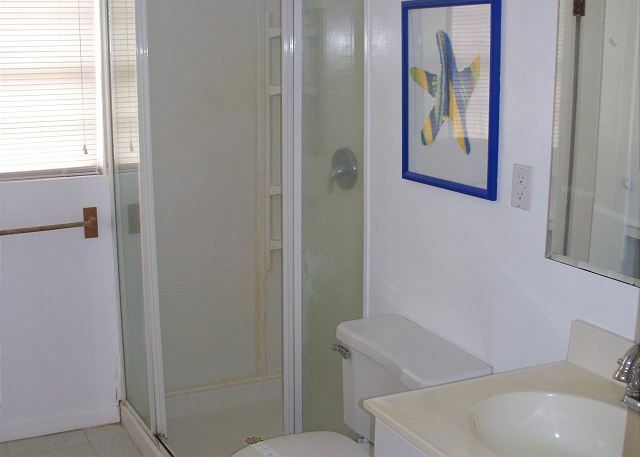 House was a little "shaky", bathroom walls did not go all the way to the ceiling, so a slight privacy issue. Ants in the kitchen, but not a huge problem. Kitchen is not well stocked - bring anything you think you might need (other than plates, glasses, forks, spoons and basic pots and pans - no mixing or storage bowls at all - no blender and I wouldn't eat anything put in the toaster they had, no seasonings or paper goods). Also, be prepared for people setting up for the day on the beach under the house. I guess since there is no parking at the house (you have to park at the end of the street and walk in), people assume the house is empty and make themselves at home in the shade under the house. Parking is not really a problem, once you get all your stuff in the house. If we could have parked up closer to the house but not a big deal. The house was clean and functional, which is what we wanted. We had dogs and the beach area directly next to the house was somewhat closed off which was nice for them to be able to move around. Overall a great trip! My experience was wonderful. It was affordable and still in decent shape! My group only really wanted to swim and the location was perfect since we could just walk off the steps and be in the water. I enjoy how peaceful my stay was. The rental was equipped with all of the necessities and very clean. Everything worked, including the big back tv(dated but functional). It's close to everything, but not in the middle of everything.I'm glad I took my own wifi. We loved this house. This will be our 'go to' house in the future. We will also recommend it to others. The view from the deck was enchanting. But watch out. You can get sunburned even while sitting in the shade of that deck, I presume from the reflection off the water. Ouch! Brought our grandkids for a three get away. This is the second stay in this house and will be back. The location was perfect. Could do without the seaweed but can't control mother nature. The only thing I would suggest is more kitchen items. Bowls, tea pitcher, etc. I would recommend this home to my friends and family. Wow - you can't get any closer to the beach than this! Really enjoyed my week at Thunder Point - Thanks BRRI! My experience with Brannan's rental is as usual a real pleasure. I especially appreciate dealing with Letha....she's great. Only way to be closer to the beach was to be out in a boat! We had a wonderful retreat. Sunsets and sunrises were awesome - loved people watching on the beach and ship watching in the jetty - the deck was awesome. The property was in fairly good condition overall for its age - had a few housekeeping issues but nothing major - there were some dead gnats /bugs on window ledges, some crinkled up blinds, and shower door kind of hard to keep on the rails. The A/C was 3 window units and worked great. Just an overall good stay! We hope to go back soon! My husband and I had a very relaxing stay at Thunderpoint. The lapping of the waves lolled us to sleep every night. We woke up the beautiful sunrises and dolphins playing in the water. The cabin itself was neat and clean. I look forward to our next trip to Thinderpoint. Have stayed in this home three times in past 12 years. Love it. Awesome view... We loved it! Could have done without the sea weed. Apparently, surf side doesn't comb the beaches. Great house, very clean, good management. Note that his house is inside the dunes, literally on the beach. Can be a bit problematic on a holiday weekend w/ daygoers crowding your space. This was beyond our expectations. Amazing location! Loved the place! Very easy company to work with! Would highly recommend! 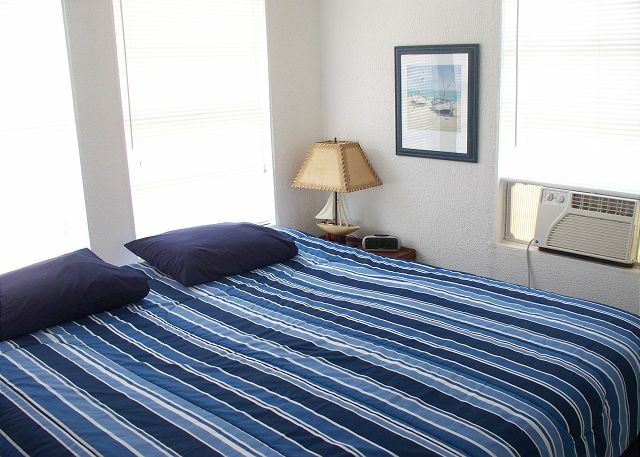 My wife and I thoroughly enjoyed or stay here, and we got to bring our dogs which was great. We had an incredible view right on our front porch and grilled everyday outside! It is great 2 bedroom house and next time we want to bring another couple with us. 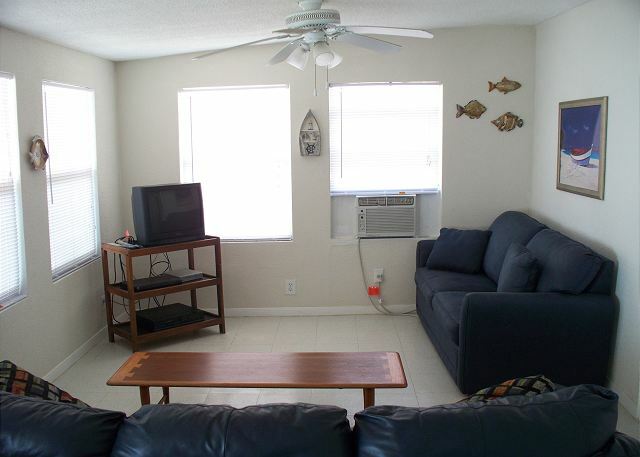 Thunder point really is a great house and actually affordable to rent! We will definitely be renting this house again! Great weekend getaway, property is literally on the water, very family/pet friendly, would stay here again. Thank you. very fun not too many people yet wetsuit and the surf was great had a blast thank you for being so reasonable with your prices, ill def keep doing business with yall. thank you again. if yall have any specials coming up give me a call @ 713.516.8843...ill take it! Wish I lived there all the time!!!! The place is small, but that'ts how we like it...homey...not so much room that you spend all your vacation time straightening up. You can't beat the view, and I love hearing the ships come in at the jetties. Can't wait to do it again. Thanks to all the help at Brannans. We really enjoyed our time in Thunder Point. During high tide the house is actually IN the water. There's an elevated walkway to the staircase. The house was a great size for just the two of us. The house was clean, the management company was great. Front porch is amazing! We would definitely stay here again. The house was just right for the two of us. We don't like feeling cramped and we had enough room for each of us to feel comfortable. The house is literally right on the beach so all we had to do was walk down the stairs and under the house and we were on the beach. Had a great time! There's beach front and then there's BEACH FRONT! Driveway may have been erroded and washed away from the tropical storm that came thru the gulf the week before our stay, but that didn't matter. The view...breath taking. It was a full moon that weekend and you got to watch the moon rise and glitter all night on the water. I pray this property makes it thru hurricane season so we can rent it again next year! You can not get any closer to the beach. Great views and great surfing waves. Bring your oun sheets and towels. We had to go buy some. There is some erosion under the house from a previous hurricane. I would still go back and stay in the same house. 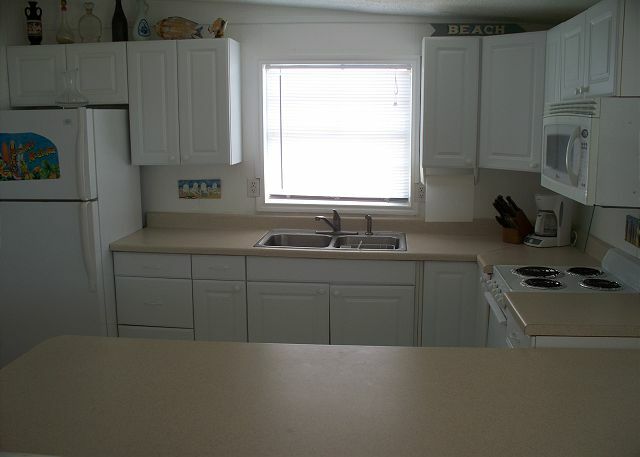 Overall, fantastic location, super close to the water. We had a great time with our kids. 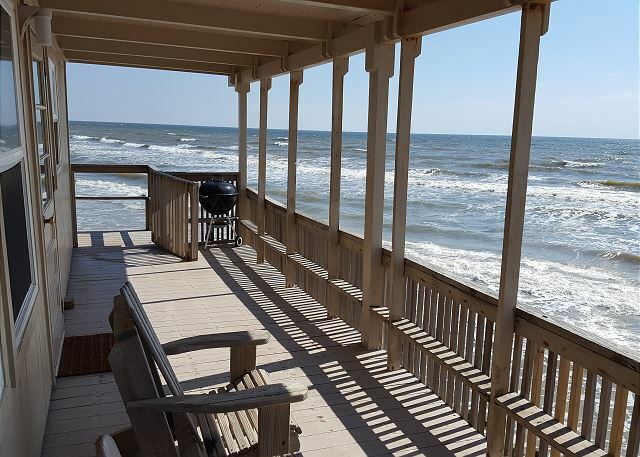 Incredibly close to the water, great porch overlooking the surf, convenient location. We hope to be back soon! We had a wonderful stay at Thunderpoint! It was right on the beach, beautiful view, nice house - much more than we dreamed it would be! We can not wait to go back!! You can't beat the view from the deck! There are a few things that need to be fixed, the towel holder in the bathroom is coming down. There was no remote for the cable TV. 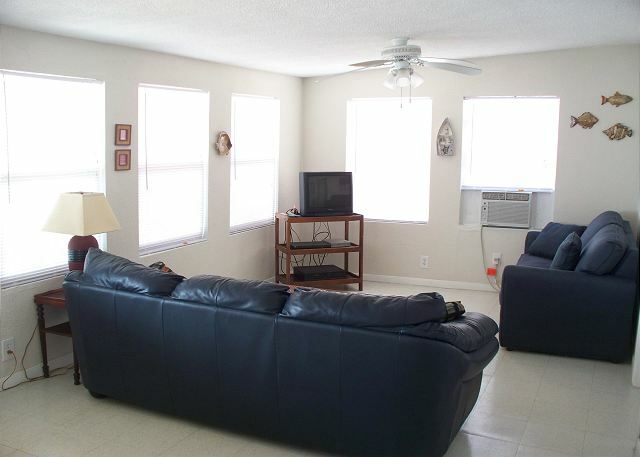 Thunder Point is a cozy home overlooking the beautiful beach of Surfside. The mornings were spent walking the beach collecting shells. The afternoons were filled with fun in the sun and the evening sunsets were amazing. 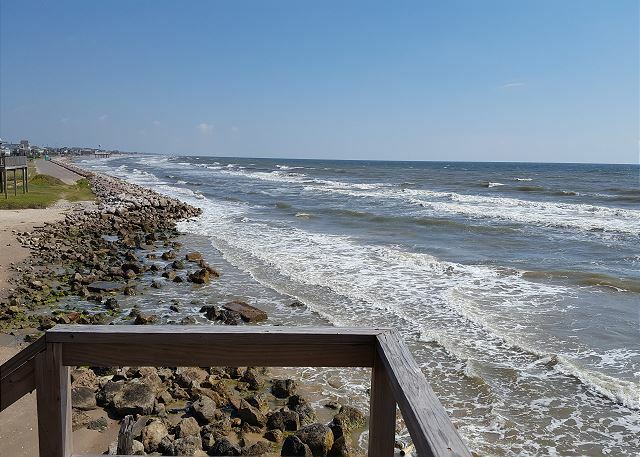 Overall, we highly recommend Thunder Point and Surfside Beach for a relaxing and fun vacation! If we could make one recommendation for Thunder Point, it would be a washer/dryer in the house. Thank you for sharing your home with us!!! Wonderful property...the closest I have ever been to the water with a beach rental!! The enclosed balcony was perfect for our two small dogs. I am already making plans to return next summer!! 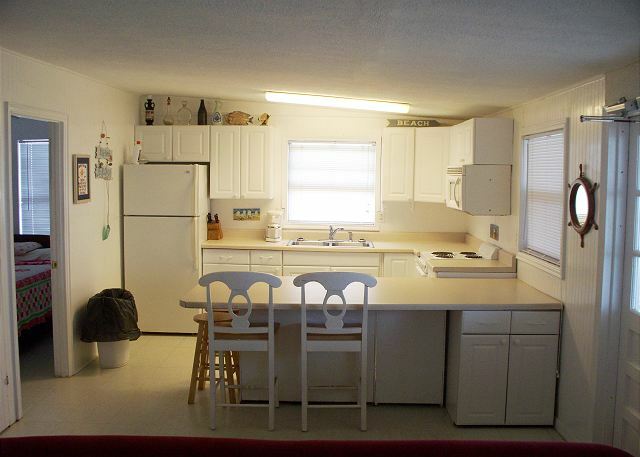 Excellent rental property, very cute, superb location. Plan to return next year. Overall we were very satisfied. We lost power for about 4 hours on our 1st day. We also had an issue with the door not locking. This was reported to the office, however, no one came to look at it. We really enjoyed our time there and are looking forward to going back again.